Geisha dance and Tea ceremony; Keiko Whitlock: Keiko Whitlock - JAPAN! 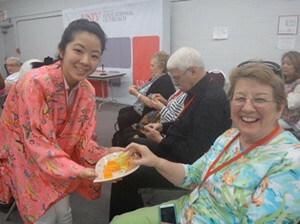 We had an awesome Japanese event on April 6!! 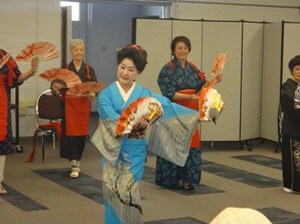 Some of our class attendees dressed in Kimono and joined Japanese dance!! In the end everyone joined and had a great time!! 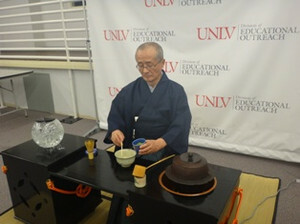 Tea Ceremony was awesome too. The tea ceremony teacher explained the history, benefits, and all the other thing about Japanese green tea and the tea ceremony. It was a solemn experience! We also shared Japanese sweets with Japanese green tea. I would like to say thank you to Carolyn and Dawn who let us use the biggest room 133 for this event. Carolyn also brought this beautiful flowers for this event. 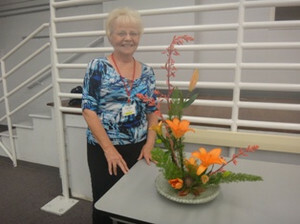 I didn't know that she was the master of Japanese flower arrangements!! Thank you all who sacrificed your time and came and enjoy this event as well as all the staff who helped us make this event a success! !